Here's a round up of some of my favorite looks from Joy Cioci, Emerson, Carlos Miele and Badgley Mischka. 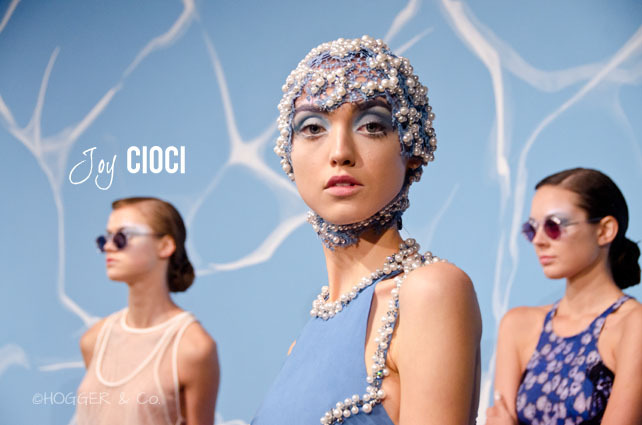 Joy Cioci's ode to a 20s summer had pearl-encrusted swim caps, sea-salted nails and beautiful blues making me look forward to Spring. We saw a lot of braids at the shows this season...and Emerson had some of the best, lying low on the forehead, and created by Zahir Ziani. Jackie Fraser-Swan's inspiration was 70s horror films, with the black and white ensembles balanced out with softer floral pieces and touches of red like the finale's burst of red confetti, Carrie-stylez. Dancing With The Stars' Maksim Chmerkovskiy was there, as were other recognizable celebs: Crystal Reed (Teen Wolf) and Johnny Wujek (ANTM creative director). You know how much I love a good print, and Carlos Miele delivered. Paula Abdul, Vanessa Williams and Daisy Fuentes are fans. (It was also fun to see Joy Adaeze in front of me) always with cool headgear and go backstage after the show. I may have been slightly more excited to spot Bryanboy (and Kelly Bensimon, who I photographed backstage at Alice + Olivia, Ivana Trump, Lauren Conrad, Kevin Jonas) in front row than to pay attention to the beauty of Badgley Mischka. That's until the show started, and then their romantic “Midsummer Night’s Dream” inspired collection had a lot of beautiful pieces that took my breath away, namely the final coral layered organza number....what a dream. Remember when this happened?